When the National Altar Guild met in Indianapolis in 2012, we had the pleasure of having Bishop Magness, the Suffragan Bishop for Federal Ministries (formerly for the Armed Forces), join us. He thanked us for our outreach project — making stoles for the military chaplains. In the conversations that ensued, he mentioned that he would like the stoles for the chaplains serving in combat zones to be made of a camouflage fabric that was washable. The National Altar Guild went to work and designed stoles to fit the need. 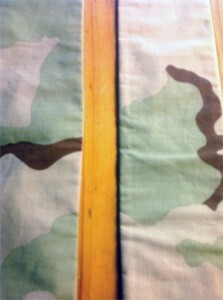 The new stoles are made with camouflage fabric on one side and a sandy tan on the other. There are two ways to finish these stoles. One is to trim the sandy tan-colored side with bands of ribbon on each end that are the colors of the seasons of the church calendar. 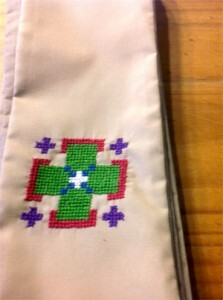 The other way is to embroidery a cross on each end of the stole. We are grateful for all the altar guild members — from all over the country — who are helping make these stoles.